I have another reader request for you today, but I must apologize because this reader wondered about a comparison between Sally Hansen XTreme Wear Purple Gala, Orly Space Cadet, and Milani Dot Com. My Milani Dot Com is missing in action--it's on my spread sheet, I know I saw it when I reorganized my storage system last month, but I can't locate it. So much for my organizational skills! Here's a look at 2 of the 3, and I'll talk more about Dot Com after the photos. Above & Below: These two look the most similar in direct sunlight (above), but in lower lighting (below), the difference is quite obvious. Below: In partial sun you can see how the gold glitter enhances Purple Gala, while Space Cadet shows more purple/violet glitter. 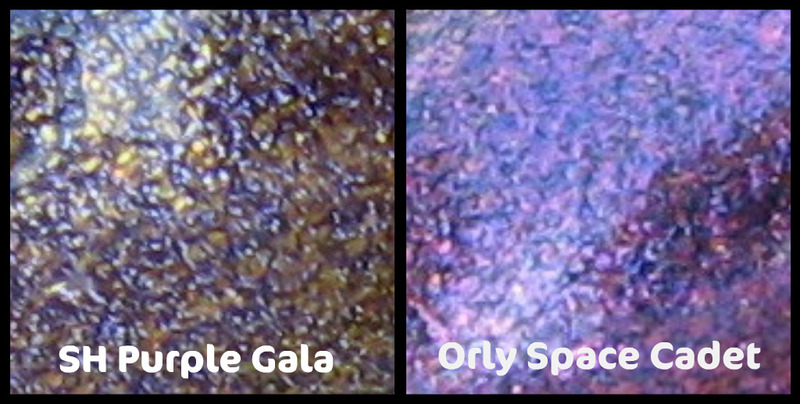 I think Space Cadet's glitter is more foil-like than Purple Gala's also. Below: A macro shot of both finishes. Below: A look at the colors that make up each shade reveals the dark aqua base and vivid light purple glitter in Space Cadet vs. the purple base and gold glitter in Purple Gala. The question was asked "are they different enough that I need them all? ", and even without being able to show you Dot Com, my answer would be yes. I'll refer you to photos posted by Steph's Closet and Kris Primps for a closer look at Dot Com. 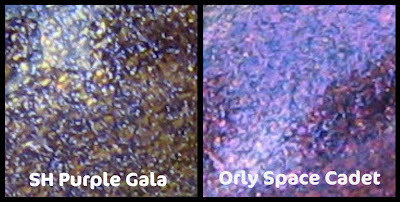 I will say that Dot Com and Purple Gala are more similar to each other than Space Cadet, although if memory serves me correctly, the glitter is a little more bronze--still gold, just not as bright, and the purple a touch more brown in Dot Com than in Purple Gala. Space Cadet also has some duo chrome which isn't found in the other two. If anyone else who is familiar with these 3 polishes cares to offer their thoughts, feel free to add them in the comments! Edited: I noticed a comment about the similarities of Purple Gala to Hard Candy's Mr. Wrong, and yes they are very similar. Here's the link where I compared those two shades. Looking at the dot com links you put up, I think it's the least similar among all 3. Those 2 are pretty close but not the same. From a further distance though, I doubt you could tell. Nice comparison! I wanted Orly Space Cadet but was all gone @ Sally Supply, later i saw purple gala and made it my "mental dupe" and think Space Cadet never existed lol. i love the cotton ball comps, please don't ever stop! Thanks for the comparison, can you make the same for Orly It's no rocket science and CG Zombie zest?